There were many conquerors in the history of mankind: there were talented physicians who conquered many illnesses; there were famous military leaders who conquered huge armies and entire countries. There are conquerors of space, there are conquerors of distance, etc. But the world does not know a single “conqueror of death” except for the Lord Jesus Christ. He alone bears this distinction. Even the world of unbelievers is unable to propose any other name. None of the most prominent people in the world have ever pretended to such a distinction. Yet He is, has been and will be – our Lord and Saviour, the conqueror of death. During His life on earth the Lord gave proof of this in three cases: the resurrection of the daughter of Jairus, the resurrection of the son of the widow of Nain, and now today – the resurrection of Lazarus. The death of the daughter of Jairus was a recent, fresh death. The girl died while Christ and her father were on their way to her. Even Christ called it “sleep,” but other people laughed at Him, knowing that the girl had died. But He made everyone leave the room, then took her by the hand and said: “Maiden, arise!” And her spirit came back to her, she arose, and He commanded that she be given food. In the case of the son of the widow of Nain death had asserted its rights more strongly: the deceased had already been placed on a bier, he not only had been carried out of his house, but was being carried out through the city gates. The Lord had to stop the bearers in order to approach the bier. And only then He said: “Young man, I say to you, arise!” The dead youth sat up and began speaking. And Christ gave him back to his mother. But aside from physical death there is also spiritual death. It happens thus: a sinful thought passes through our mind and incites in us a sinful feeling, but the soul comes to its senses, cries out to the Lord in repentance, and the Lord extends His hand as to the daughter of Jairus and says: O soul, arise! And once again life goes on joyfully. But it may also happen that we do not come to our senses in time, and sin enters our soul more deeply, but even then, through the prayers of the Church, our soul can still rouse itself, can repent, and the Lord will say to us as He did to the son of the widow of Nain: O soul, I say unto thee – arise! And our soul will come alive again and will be granted salvation. But what is to be done if sin enslaves our soul completely, covers it as though with a huge burial stone, and turns into a passion which becomes sinfully malodorous… as in the case of Lazarus? What do we do then? In this case we have great need of confession, the sacrament which has been established by the Lord Himself. 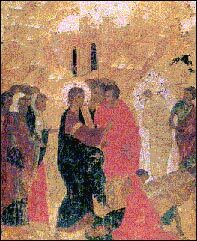 Look at how it is reflected in the resurrection of Lazarus. Lazarus could not leave the burial cave by himself – it was covered by a huge stone. He could not even walk properly, because he was bound hand and foot by the grave-clothes. And at this point Christ said to His disciples: loosen him. Applied to us this means that the Lord commands clergymen, who have received the gift of the Holy Spirit in the sacrament of ordination, to absolve our sins which bind us hand and foot. What joy for us! For death is not the cause, but only the result or consequence of sin. And Christ is also the conqueror of sin, and together with it – of death itself. Let us triumphantly proclaim: hosannah in the highest! Amen.